Each time a new iteration of GI Joe comes on the scene, there’s an inevitable wish list of characters that fans want to see made. Though there were quite a few homages to the old days during the new sculpt era, some of the popular classics were left out. One of my old favorites eventually saw a release in the Direct to Consumer line. I find the take on the uniform to be an interesting departure from the 80’s version. 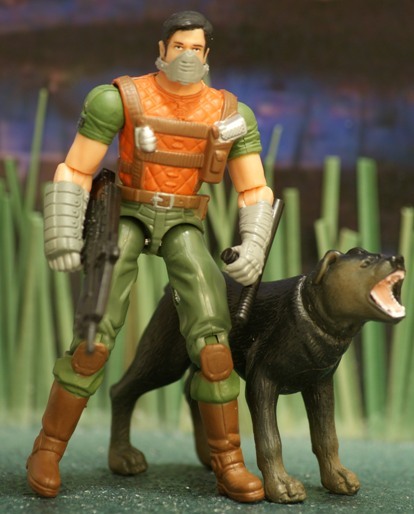 Though it appears he borrowed Spy Troops Roadblock’s padded vest, a few of the old Mutt elements remain, most notably the padded gauntlet, nightstick and muzzle. However, the figure seems incomplete without a helmet. The MAC-10 is also gone, replaced by a rifle that bears some resemblance to the DEF Mutt’s weapon. 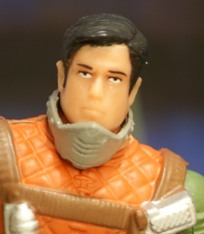 The head sculpt looks much younger and more fresh-faced than the Joes’ usually sour-tempered dog handler. And what happened to Junkyard? He looks more like a Rottweiler now than a Black Lab. This was also another case of the card art being more appealing than the figure itself. The same thing was happening all through the new sculpt era. Then again, the 80’s and 90’s had its share of figures and vehicles whose package art was much more exciting than the toys inside. What is the mask for? And did Mutt start putting roids in Junkyard’s Purina? The muzzle just looks weird without a helmet. It looks like Mutt lost weight and Junkyard gained. The torso is a new sculpt, and the DEF Mutt didn’t come with a rifle, just a pistol. When that figure got released in the Battle Corps line, he got Headman’s rifle. As for this figure, all I gotta do is paint a mustache on him and use an extra Grand Slam helmet (sans strap) to complete the look. This figure has plenty of flaws but it’s worlds better than the 25th Anniversary Mutt figure. That thing was hot disaster, a total failure. Nope. Junkyard is (was?) a Doberman. Remember how notorious they were in the ’80s? Back before pitbulls and rottis took the “baddest dog” title. The figure isn’t bad for the era, but Mutt seems like a mustache guy and the look doesn’t suit him. Plus, why keep the human-muzzle and ditch the helmet? It’s not like Junkyard is gonna bit him, right? What’s with the holster? It’s not a cross draw, he’d have to lift the pistol up with his left hand…seems awkward in life or death situation. I’d never seen this version before this article, but just going by these pictures, I’m not a fan. On the positive side, I really do like the dog. It’s probably the best version of Junkyard I’ve seen. And yeah, as far as I know (atleast going by the cartoon), Junkyard has always been a rottweiler.